Muncie Funeral Parlor, 1910s. Indiana Memory. In an earlier blog post for Hoosier State Chronicles, we did a tour through wedding notices in the pages of Indiana newspapers. It seemed fitting to do a follow up post about one of life’s other milestones: your death. Not yours specifically, but the history of funeral parlors and funeral homes in Indiana. 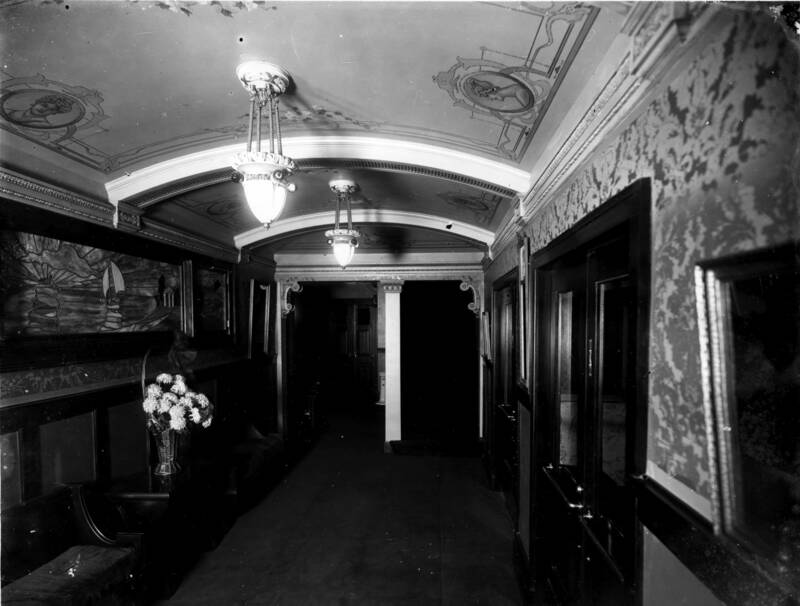 The funeral parlor, or funeral home, became a mainstay of American life in the late nineteenth century and into the early twentieth century. Before that, most American families held a wake (now called a “viewing”) in their home, in a room often named the parlor. Then, they were either buried on the family homestead or in the cemetery by their church. The Civil War changed that; massive numbers of dead soldiers from across the country prompted new funerary practices, such as embalming and preserving for long trips. After the war, industrialization, urbanization, and the rise of middle class facilitated further modernization of funerals. It was here that the funeral parlor, or funeral home, became the norm. 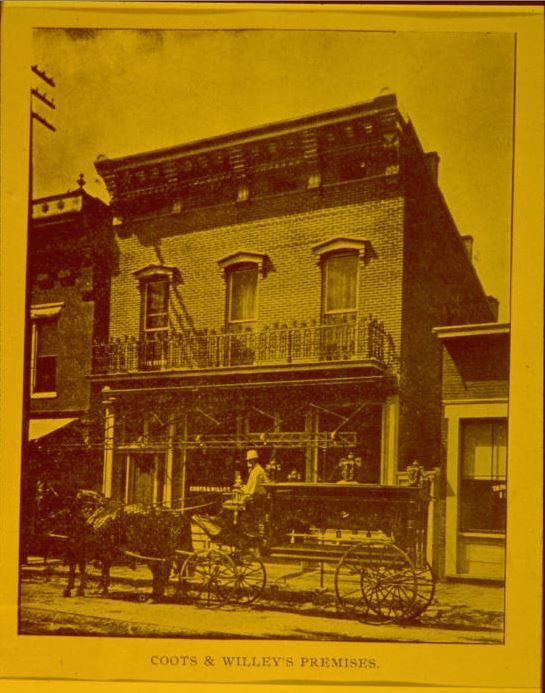 In this blog, we will share with you how the funeral homes of Indiana’s past often advertised themselves in newspapers and how they developed into the modern, standardized industry that they are today. 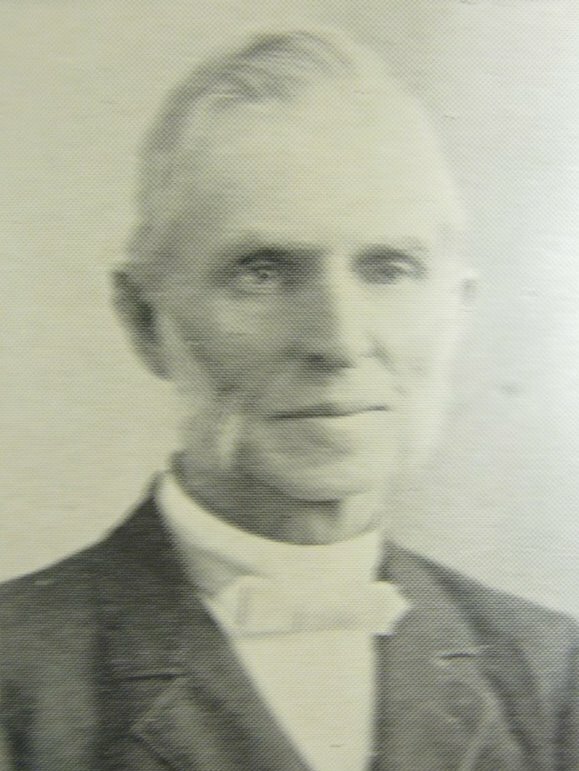 Isaac Ball, the co-founder and first president of the Indiana Funeral Directors Association. Find a Grave. Terre Haute Saturday Evening Mail, May 21, 1881. Hoosier State Chronicles. Coots and Willey’s Funeral Parlor, Jeffersonville, Indiana, 1897. Indiana Memory. While “funeral director” became the accepted industry term, it took a few years for funeral homes around the state to use the term. 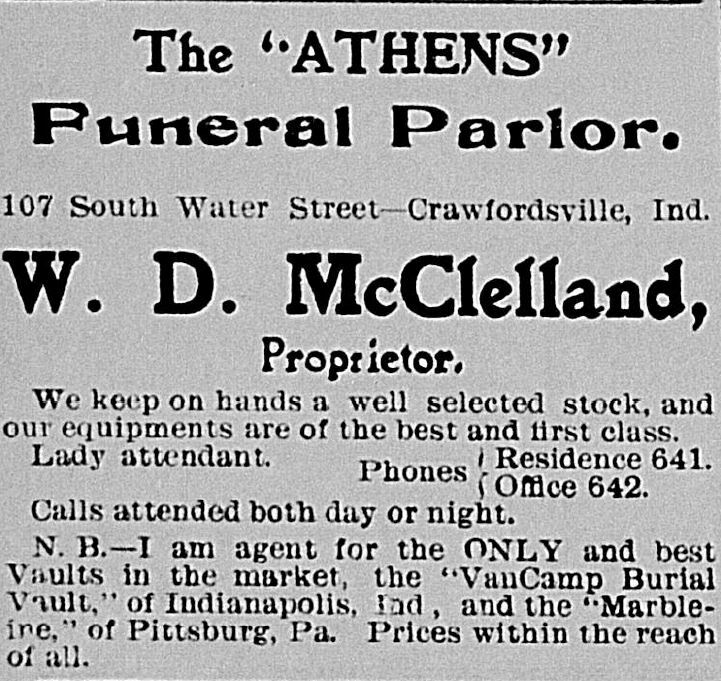 Some of the earliest uses of “funeral director” found in Hoosier State Chronicles are in the Indianapolis News. Its April 21, 1899 issue printed a funeral director section on its classified page; similar funeral director sections from the classified pages can be found in 1916 and 1918, respectively. Individual funeral directors, such as Indianapolis’s Frank W. Flanner & Charles J. Buchanan, adopted the term as early as 1888. Crawfordsville Weekly Journal , June 14 1901. Hoosier State Chronicles. Crawfordsville Weekly Journal, May 2, 1902. Hoosier State Chronicles. Another ad ran in a 1902 issue of the Crawfordsville Journal. 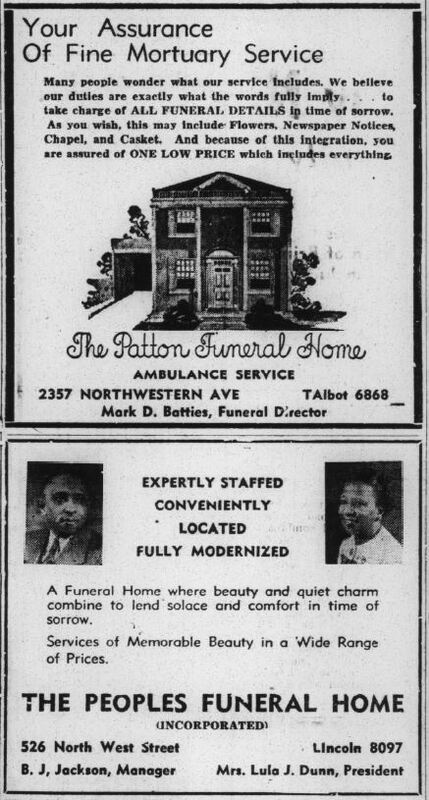 The later ad provided more details on the staff of the funeral parlor. 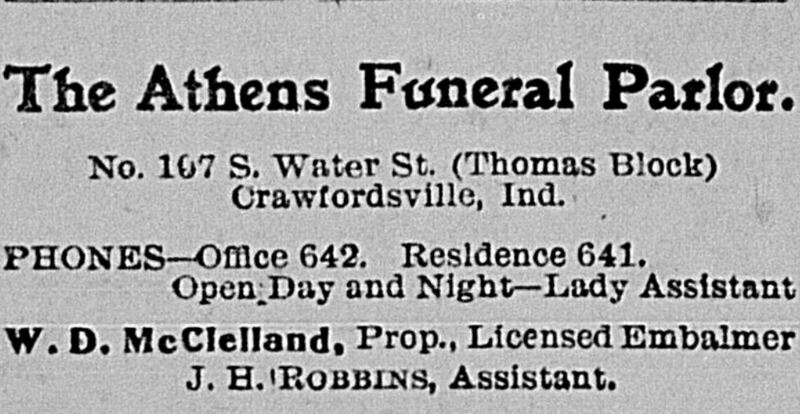 Alongside McClelland’s title as “proprietor” and “licensed embalmer.” He also employed a “lady assistant” (to prepare the bodies of deceased women and girls) and a business assistant named James H. Robbins. Indianapolis Recorder, January 12, 1907. Hoosier State Chronicles. Indianapolis Recorder, February 9, 1907. Hoosier State Chronicles. Indianapolis Recorder, July 11, 1914. Hoosier State Chronicles. One demographic well documented in Hoosier State Chronicles, in regards to funeral homes and directors, is the African American community. 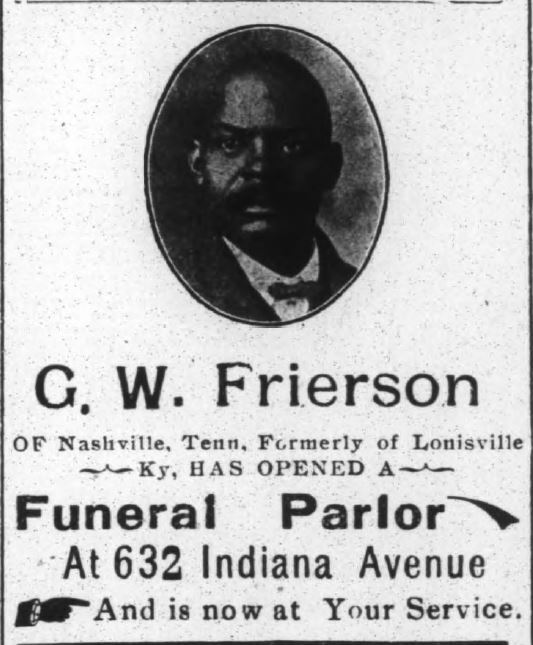 George W. Frierson, originally from Nashville, Tennessee and then Louisville, Kentucky, established a funeral parlor at 632 Indiana Avenue (near the Walker Theatre) in 1907. 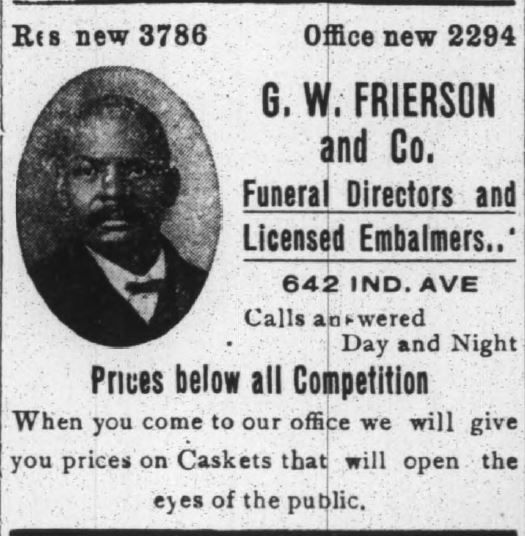 The first published ad for Frierson’s funeral parlor ran in the January 12, 1907 issue of the Indianapolis Recorder. 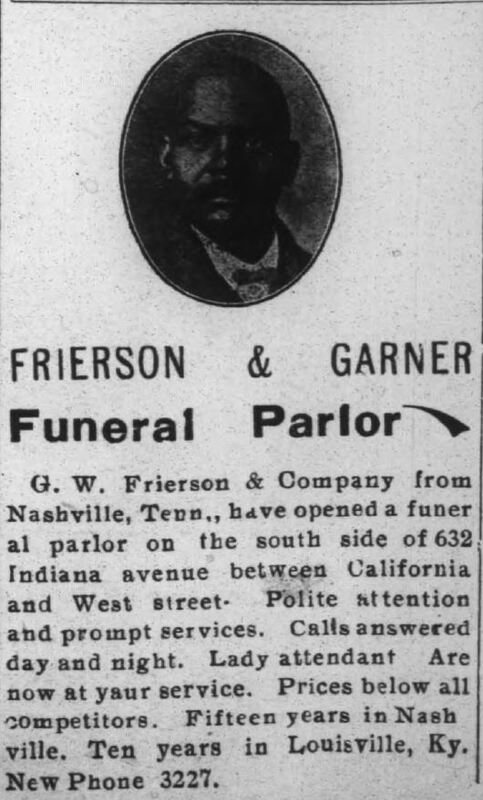 About a month later, a new ad ran in the Recorder confirming that Frierson partnered with James B. Garner, an embalmer. Frierson served as the “proprietor” and Garner as the “manager.” Like McClelland back in Crawfordsville, they also had a “lady attendant.” Frierson maintained his funeral parlor until at least 1914, at which point it was located at 642 Indiana Avenue. W. A. Gaines Funeral Home, Evansville, Indiana, 1920. Indiana Memory. 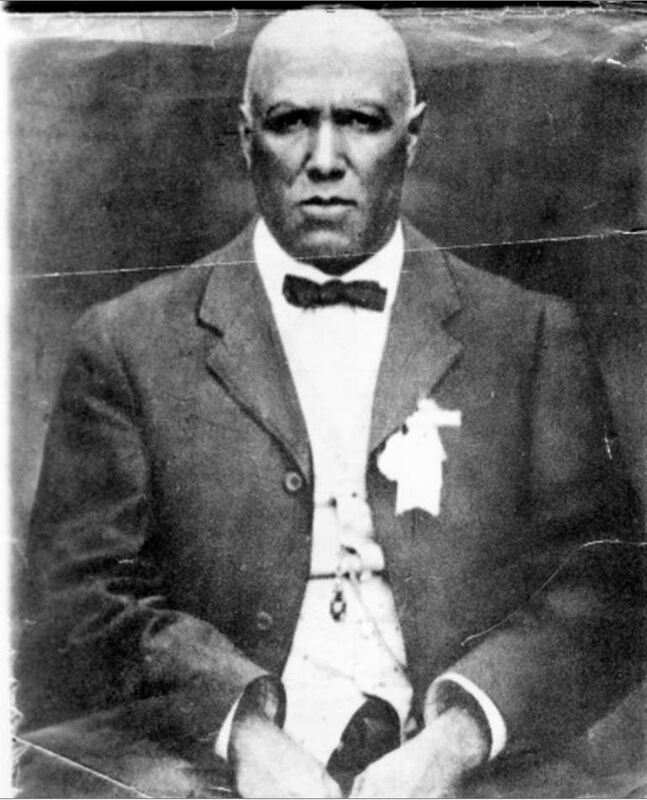 Portrait of W. A. Gaines, 1920. Indiana Memory. Evansville Argus, September 26, 1942. Hoosier State Chronicles. 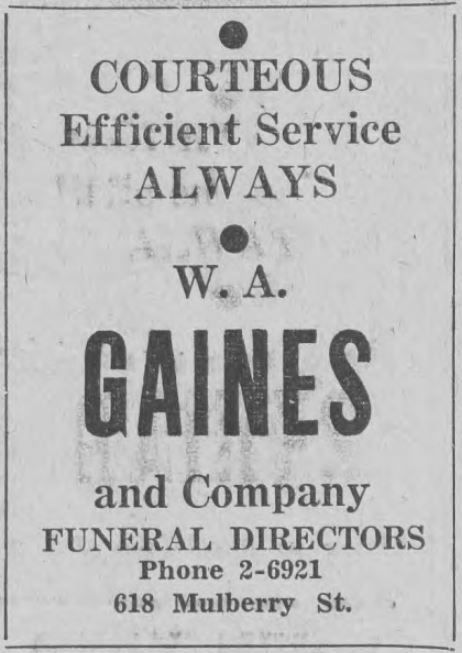 Another key African American funeral parlor owner was Wallace A. Gaines of Evansville. Gaines founded the W. A. Gaines Company in 1918 with wife Tillie Y. Gaines and Rudolph D. O’Hara and $5,000 in initial capital, according to the Indianapolis News. It ran ads in Evansville newspapers for decades, with the particular ad in the September 10, 1938 issue of the Argus being an example. 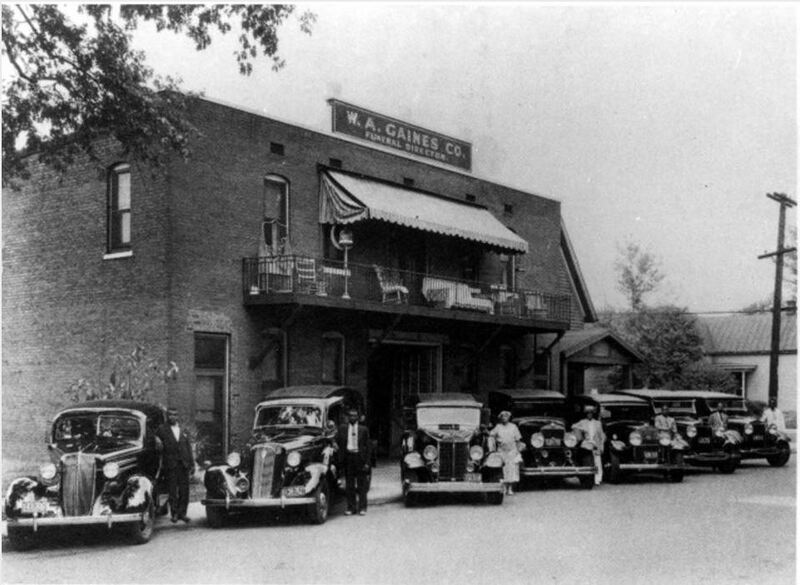 Gaines died in 1940, but his funeral home operated until at least 1989, when the last mention of its operation was made in the Indianapolis Recorder. It was then run by Michael J. Bluitt, who owned the funeral home and served as one of IFDA’s presidents. Richmond Palladium, October 26, 1914. Hoosier State Chronicles. While funeral parlor ads generally represented newspaper coverage, pithy anecdotes also made the cut. An interesting story out of Chicago and published in the Richmond Palladium noted that “Eighty women, playing cards for a prize, adjourned their game to an undertaking room and continued playing . . . with several coffins . 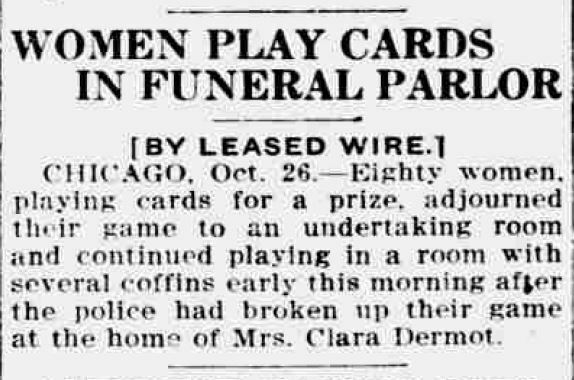 . . .” The ladies moved to the funeral parlor “after the police had broken up their game at the home of Mrs. Clara Dermot.” It is unclear whether or not the coffins were occupied. South Bend News-Times, January 26, 1915. Hoosier State Chronicles. 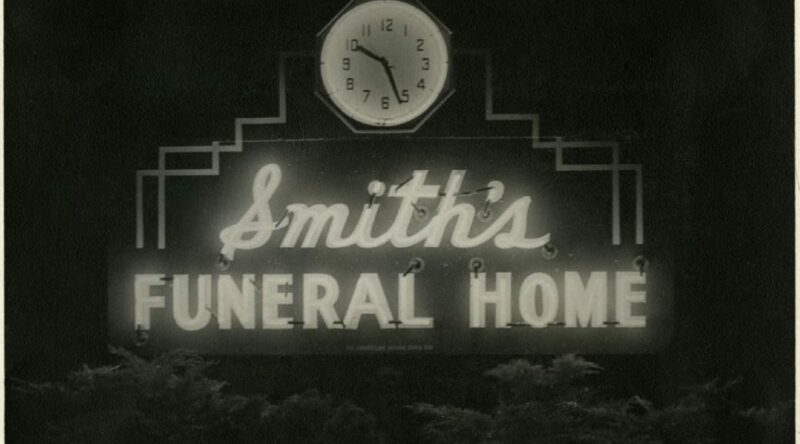 Up in the north, the city of South Bend maintained a few funeral parlors in the early 20th century. Harry L. Yerrick ran a funeral business in the 1910s in South Bend, as sort of a jack-of-all-trades with funerals. 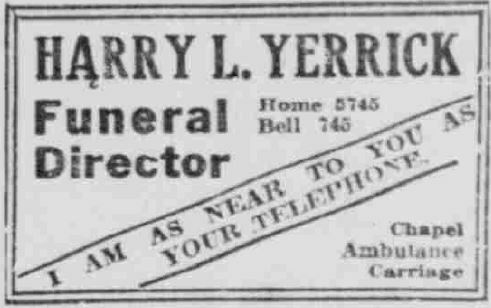 In a 1915 ad in the South Bend News-Times, Yerrick declared that “I am as near to you as your telephone” and cited multiple services, including a chapel, an ambulance, and a carriage. Yerrick died in 1920 and Clem C. Whiteman and Forest G. Hay took over the business. Whiteman owned a wholesale grocery company and Hay was the partner given “active charge of the business for the present.” In September of 1920, James H. McGann joined the business as their “licensed embalmer”, holding “one of the highest grades in the state” for his profession. Over the decades, McGann eventually created his own funeral home business while Hay’s also flourished. In 2005, after multiple generations of their respective businesses, they merged to form the McGann-Hay Company. The funeral home is now based in Granger, Indiana. What started as one guy’s profession became a decades-long, family-run business that still operates today. 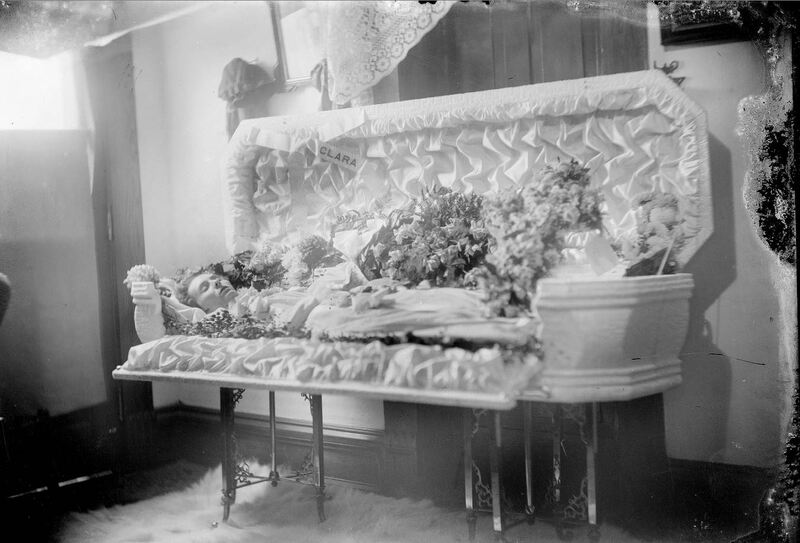 Casket With the Body of a Young Woman Clara, Spiceland, Indiana, 1900s. Indiana Memory. After the last rites are said over a departed relative, and the family recalls with comforting satisfaction the smooth attentive manner in which everything was executed, then comes a realization of the assuaging helpfulness of the thoughtful funeral director. It is this faithful service that endears the funeral director in the hearts [of] families and in such manner we have built up our business. Our desire always is to serve in a thoughtful dignified way. Indianapolis Recorder, February 12, 1927. Hoosier State Chronicles. 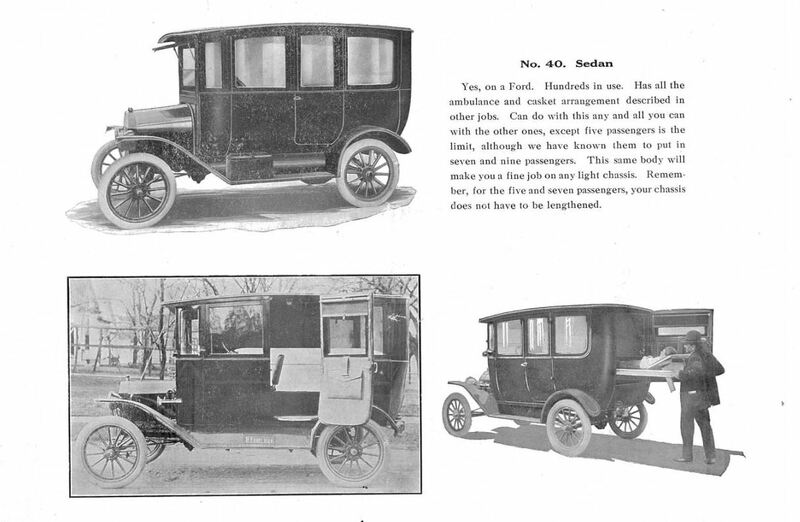 Knightstown Buggy Company Catalog, 1920s. Indiana Memory. Indianapolis Recorder, January 19, 1929. Hoosier State Chronicles. This trend continued into the 1930s. 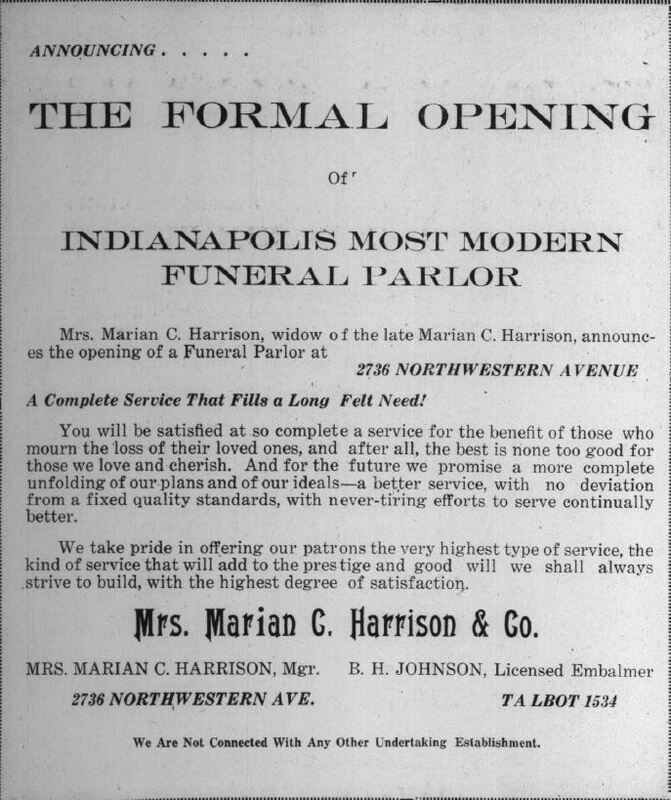 The Willis Mortuary in Indianapolis published an ad in a 1936 issue of the Recorder that called it their “honor to serve you in your hour of bereavement” and “endeavor[ed] to live up to your greatest expectations.” Nearly a decade after the illustrious grand reopening of the Harrison funeral parlor, brothers Plummer and Carey Jacobs opened up their Indianapolis Funeral Home on October 30, 1938. Two days before, they took out a whole-page ad in the Recorder to inform the public of their formal opening, including a full program of events and photographs of their new facilities. 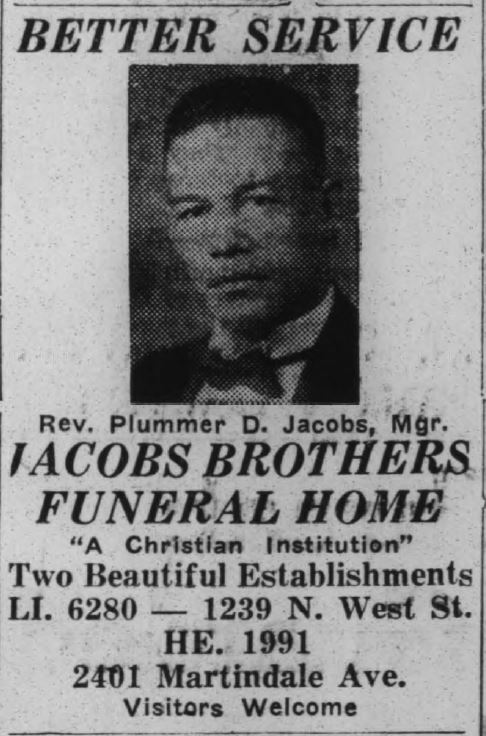 A few days later, the Recorder ran an unsolicited article about the Jacobs Brothers Funeral Home grand opening. 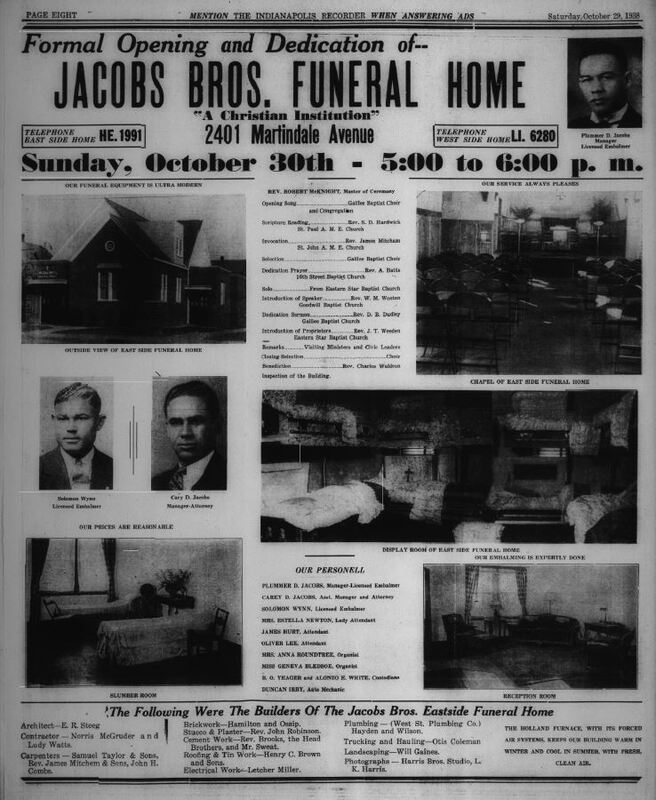 “Marking another milestone in the increasingly brilliant parade of business activities among colored persons,” the Recorder reported, “thousands of persons swarms the new eastside funeral home of Jacobs Brothers in an unbroken stream Sunday.” They further added that the “general comment is that this is finest funeral home in the city for our people.” The Jacobs brothers had joined a long, historic line of groundbreaking, African-American funeral directors in Indianapolis. Indianapolis Recorder, October 29, 1938. Hoosier State Chronicles. Indianapolis Recorder, November 5, 1938. Hoosier State Chronicles. As the 1940s went along, not only did funeral home ads get more detailed, but the funeral home section did as well. 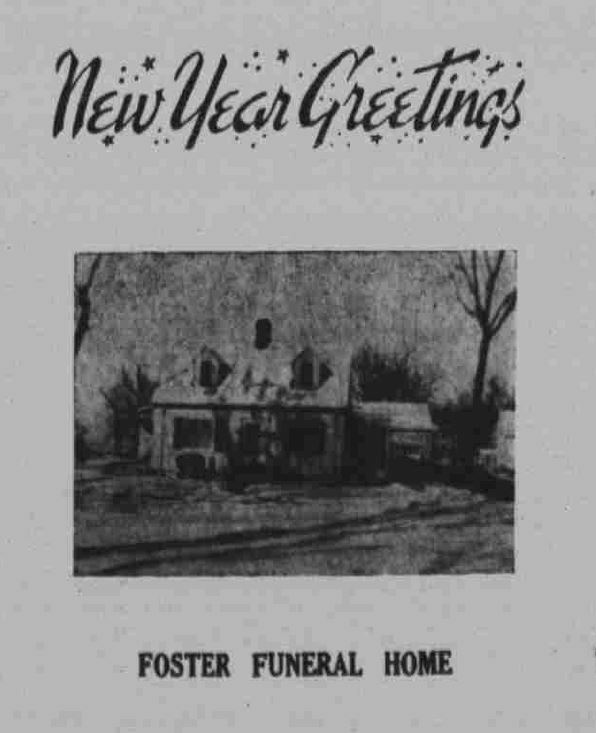 A 1949 issue in the Indianapolis Recorder dedicated an entire newspaper column to fully detailed and illustrated funeral home ads, for such businesses as the Willis Mortuary, King & King Funeral Home, and the aforementioned Jacobs brothers. 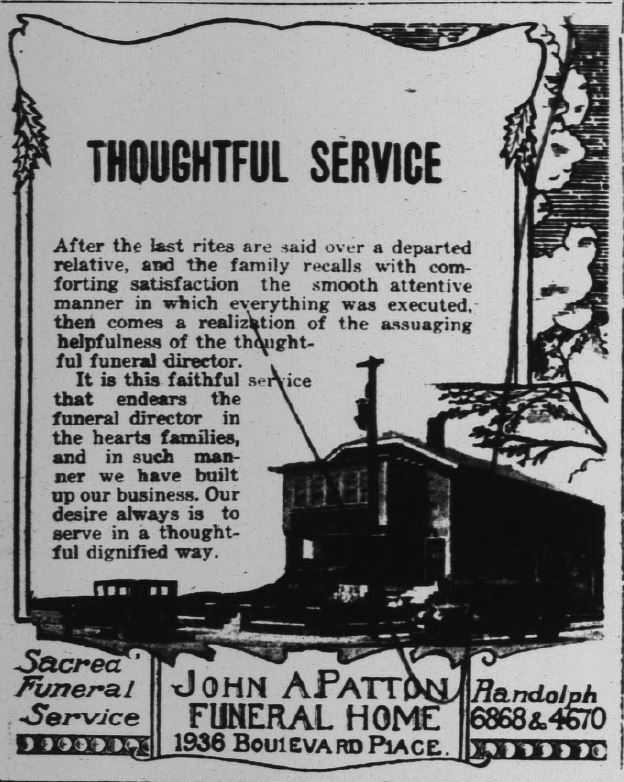 However, some papers, like the Sullivan Daily Times, stuck to a more simple approach to funeral homes, with one, non-detailed ad for the McHugh funeral home and a smaller ad for M. J. Aikin & Son. Indianapolis Recorder, November 26, 1949. Hoosier State Chronicles. Speaking of the King & King funeral home, one of their more unique ads ran in the winter of 1951. King & King released a full-page ad on December 22 wishing the community a Merry Christmas. It came with a holiday message, much akin to a greeting card, and advertised the funeral home at the bottom, emphasizing their “Ambulance Service.” Now, if this strikes the reader as odd, other funeral homes engaged in this practice. 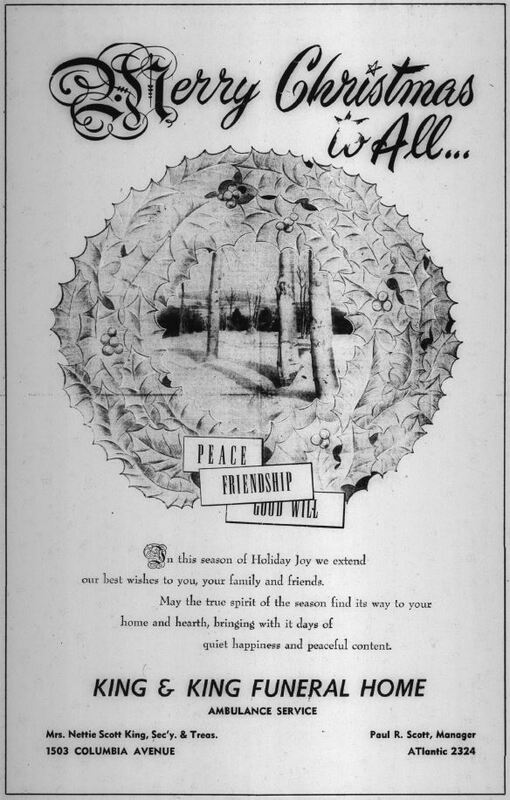 As an example, a December 1963 ad in the Wolcott Beacon from the Foster Funeral Home wished readers a happy new year. They didn’t, however, advertise their ambulance service. Indianapolis Recorder, December 22, 1951. Hoosier State Chronicles. Wolcott Beacon, December 26, 1963. Hoosier State Chronicles. The 1960s brought further experimentation to funeral home ads in newspapers. 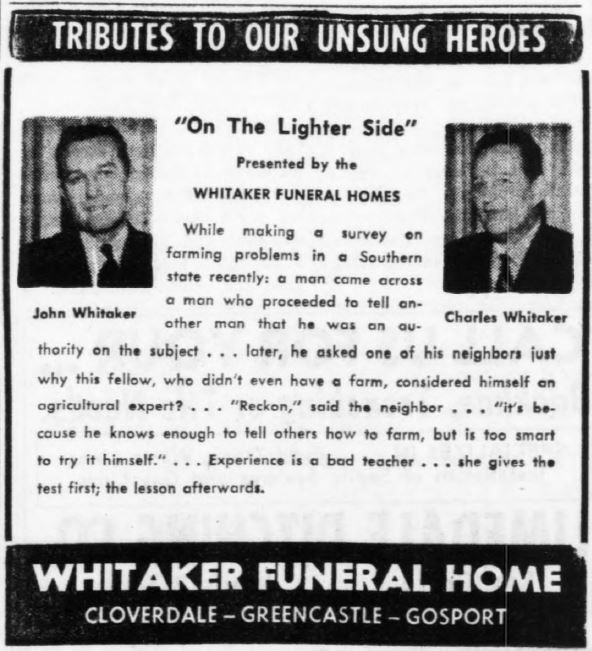 A rather clever ad in the Greencastle Daily Banner displayed the Whitaker Funeral home, who used their ad space to share with readers a short fable. “Experience is a bad teacher,” the story declared in its final line, “she gives the test first; the lesson afterwards.” Using ad space to share an amusing homily while advertising a funeral business appears inappropriate, but it actually elicits from readers a humble, personal connection that personifies the best in advertising. Greencastle Daily Banner. February 19, 1968. Hoosier State Chronicles. J. 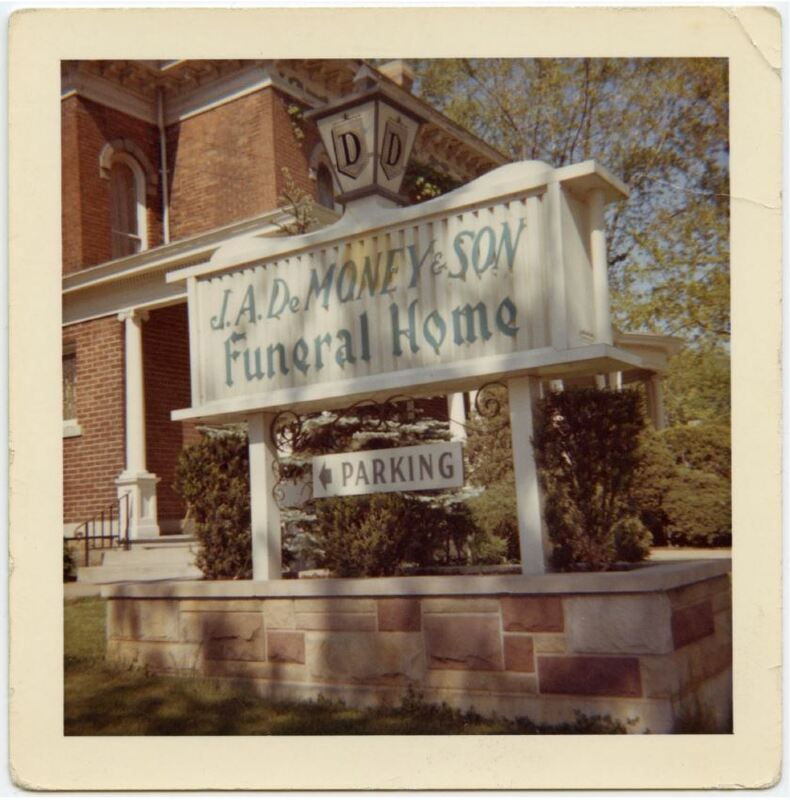 A. DeMoney & Son Funeral Parlor, Columbia City, Indiana, circa 1960. Indiana Memory. Ads and business articles about funeral homes comprise the majority of coverage in newspapers, but occasional editorials surfaced as well. 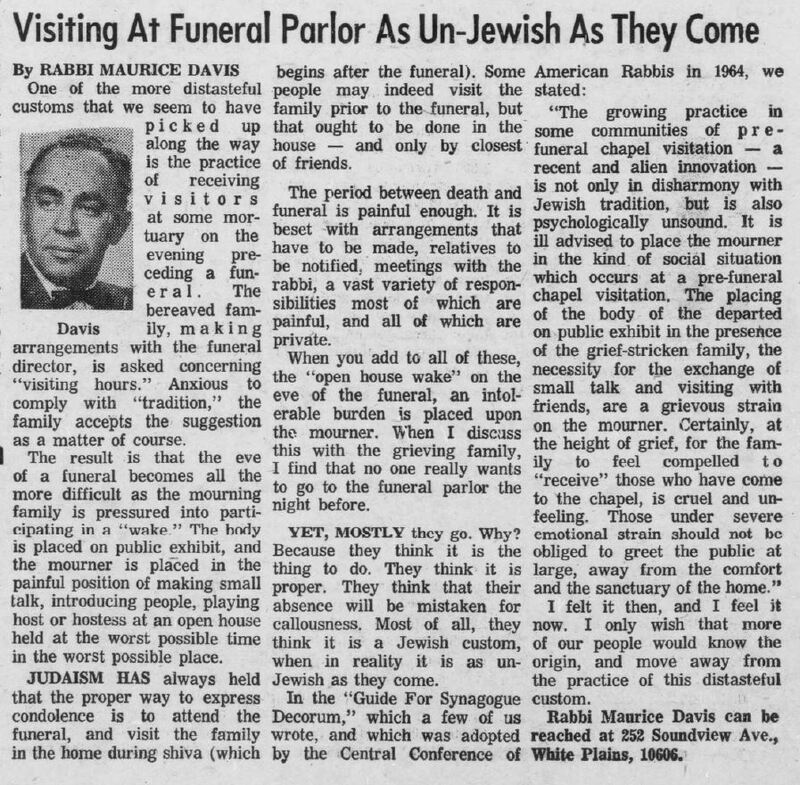 In the April 21, 1972 issue of the Jewish Post, Rabbi Maurice Davis wrote a heavily critical editorial concerning a funeral practice, not of the directors, but of the visitors. Entitled, “Visiting at Funeral Parlor as Un-Jewish as They Come,” Rabbi Davis lambasted the practice of a “wake” the night before a funeral, arguing that the “pre-funeral chapel visitation” goes against Jewish traditions of shiva (meeting with the family at their home after the funeral) and violates the mourners’ rights to privacy. “I only wish,” Rabbi Davis wrote, “that more of our people would know the origin, and move away from the practice of this distasteful custom.” The wake has continued to be a common practice at funerals since Davis’s time, but his editorial educates readers on traditional Jewish funeral practices. Jewish Post, April 21, 1972. Hoosier State Chronicles. Circling back to advertising, funeral homes often used their newspaper space to celebrate their anniversary as a business. 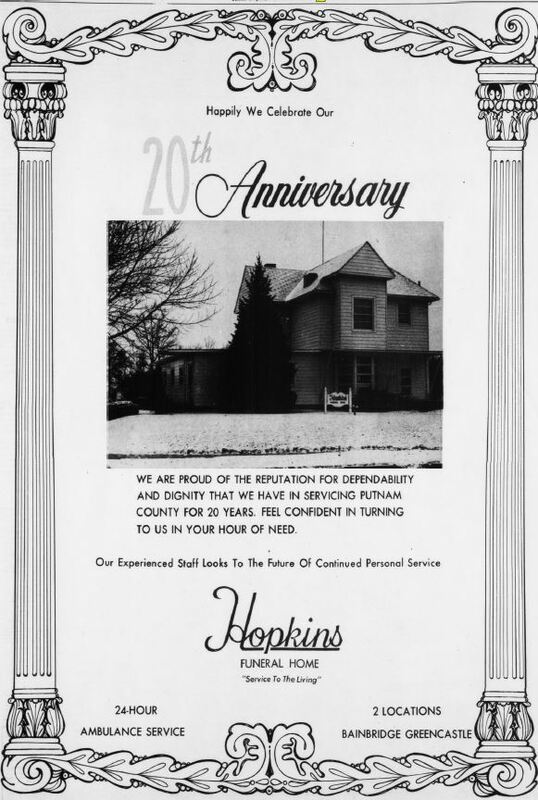 The Hopkins Funeral Home put out an ad in the Greencastle Banner Graphic in 1973 celebrating their 20th anniversary. “We are proud of the reputation for dependability that we have in servicing Putnam County for 20 years. Feel confident in turning to us in your hour of need,” the full-page ad lauded. Greencastle Banner Graphic, December 13, 1973. Hoosier State Chronicles. 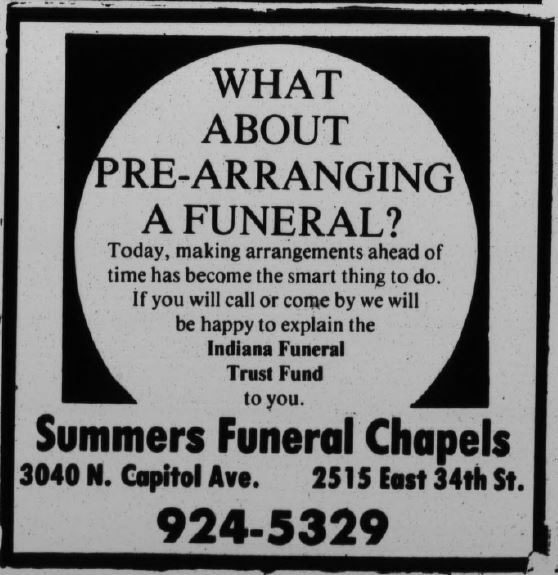 Ads from the 1980s and 90s highlighted the benefits of pre-arranging funerals, an expanding practice during the last 30 years. 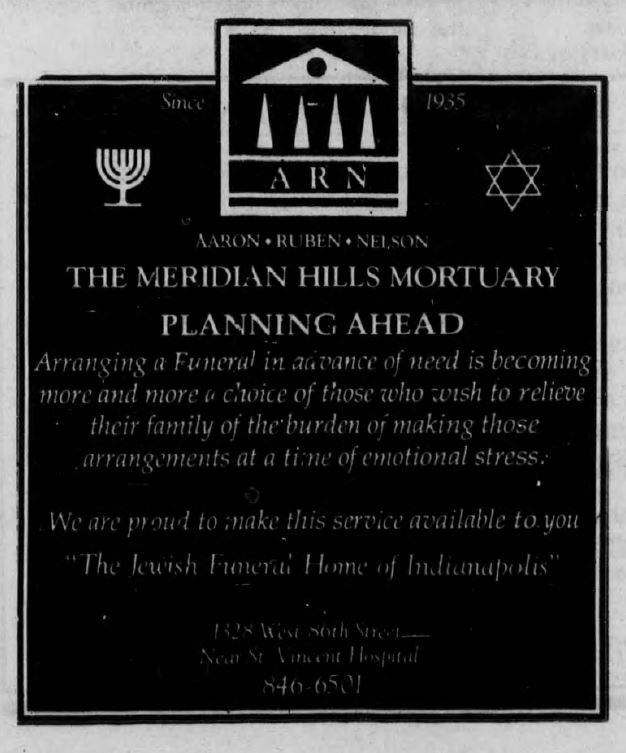 Summers Funeral Chapels published an ad in the Indianapolis Recorder in 1989 selling the benefits of pre-arranged funerals, noting that “making arrangements ahead of time has become the smart thing to do.” The Meridian Hills Mortuary sent out an ad in a 1994 issue of the Jewish Post that also advocated for pre-arranged funerals. “Arranging a Funeral in advance of need is becoming more and more a choice of those who wish to relieve their family of the burden of making those arrangements at a time of emotional stress,” the ad stressed. This trend continued into the 2000s as well, with the Stuart Mortuary and the Washington Park North Cemetery and Funeral Center urging patrons to consider a pre-arranged funeral plan. Indianapolis Recorder, January 14, 1989. Hoosier State Chronicles. Jewish Post, February 9, 1994. Hoosier State Chronicles. For over 120 years, funeral homes and funeral directors have gone from a small, burgeoning family enterprise to big business. Nevertheless, the focus on dignity, customer service, and the importance of family continued in the pages of newspaper ads. Whether it was Isaac Ball and the IFDA re-configuring an industry or modern funeral homes pitching pre-arranged funeral plans, the emphasis on being a caretaker for the bereaved has never wavered. Death is a sore topic of discussion; people fear it and often ignore it altogether. Yet, it’s as much as a part of life as a birth, a graduation, or a wedding. It also helps us understand how we live, as a culture. Funerals changed as America, and Indiana, changed; they evolved from mostly rural and familial affairs into urban and professionalized practices. In sharing this history, as it unfolds in the pages of newspapers, we understand a crucial part of Hoosier life over the last century.